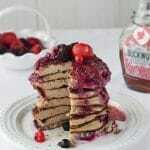 Delicious and healthy pancakes served with a fresh berry sauce. In a food processor, blend the almonds, bicarbonate of soda, honey and coconut oil together until completely smooth. Add the coconut flour, banana and eggs - blend again to make a smooth batter then slowly add the milk a tbsp at a time to create a mixture that falls off the spoon but isn't too runny. Heat a tsp of coconut oil in a frying pan or griddle on medium heat. When it's hot, make your first pancake by dropping 2tbsp of batter into the pan and gently smoothing into a circle. Cook for about 30 seconds - 1 minute on one side then gently flip them over to cook for a further 30 seconds on the other side. Use the first pancake as your "test" one to judge how long they need. Transfer the cooked pancakes onto some kitchen towel to absorb the extra oil. Make the berry sauce by simply heating the berries in a saucepan with the lemon juice until thick and gloopy! Stack the pancakes and drizzle the sauce on top with some fresh berries. Add some extra maple syrup to serve. Coconut flour absorbs a lot of liquid, so try letting the mixture sit for a few minutes to see how much more milk needs to be added. Don't be tempted to flatten the pancakes with your spatula - this will deflate them! Add more oil to the pan if it dries out before adding your next pancake. If you don't like banana - try a different fruit puree, such as applesauce.